In my novella, A Christmas Promise, I write about Moravian missionaries in Schoenbrunn Village, circa 1773 and how they celebrated Christmas. The Moravians brought many Christmas traditions to America that we use to celebrate Christ’s birth today. Here are a few of them. Christmas Eve Candlelight Services: Most churches have Christmas Eve services where they sing Christmas carols and light candles to show Jesus came to be the light of the world. The Moravian Church has been doing that for centuries. They call their services lovefeasts. During these lovefeasts they have a part of the service where they serve sweetbuns and coffee – juice for the kids – and share Christ’s love with each other. For candles, Moravians use bleached beeswax with a red ribbon tied around them. The white symbolizes the purity of Christ and red symbolizes that His blood was shed for us. 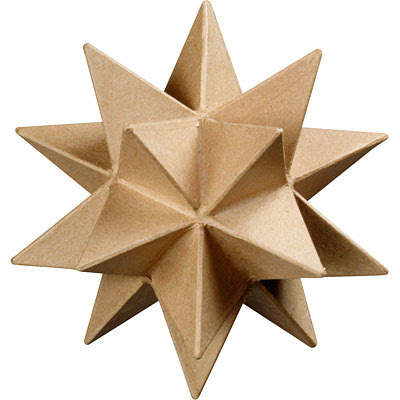 The Moravian Star: In the 1840s at a Moravian school, students made 24 point stars out of triangles for their geometry lessons. Soon those Moravian stars started making their way on the tops of Christmas trees. The star as a Christmas tree topper is still popular today. The Putz: The putz is a Christmas nativity scene surrounded by villages or other Biblical scenes. Moravian children in the 1700s would make a putz to put under their Christmas tree. Today, nativity scenes and Christmas villages are popular decorations. Book Give-Away Contest: Enter a comment below telling what your favorite Christmas tradition is. 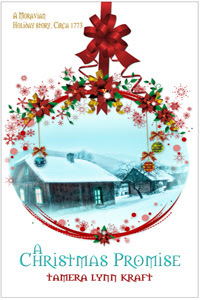 The winner of the drawing will receive an e-book copy of A Christmas Promise. Drawing will take place Friday, December 1st. I grew up in a heavily Moravian area of Pennsylvania and am PA German myself. Our family was Reformed, but we loved Christmas, too. I love the creche we brought from Israel a long time ago. Considering the Creche came for Israel where Christ was born, it must be very special to you. It is. I remember when we bought it at a shop in Nazareth. I have a small lighted nativity scene that I place at the bottom of our Christmas tree and this year, our 21 month old granddaughter will be introduced to the story of Jesus's birth. That sounds like a wonderful way to teach your granddaughter, Connie. Being a missionary to Central America, it was difficult to adjust. But being one all those years ago, what determined folks they would had to be. I agree, Melody. Thank you for your service to Christ and to Central America. My favorite Christmas tradition, that my family has done since I was a child, and I have continued with my family, is the reading of the Christmas story from the Bible by the eldest male present. This is done before the presents and al the hoopla. Sounds like a wonderful way to start Christmas, Heather. I love Tamera's stories. Traditions are wonderful and one we certainly enjoy is going to see what Santa brought our grands and enjoying a wonderful breakfast on Christmas morning. Melanie, thank you so much. Have a wonderful Christmas with those grandbabies. I love Christmas trees too, Betti. Since I have 12 children they can't buy gifts for all their siblings. On Thanksgiving I put everyone's name in a bowl and they pick one of their siblings a Christmas gift . Everyone has the same price cap. It's always fun watching them open their gifts from each other on Christmas eve. 12 children. Wow, that's a houseful. My family has many traditions, but my absolute favorite is gathering in the living room with my family on Christmas Eve to watch A Smoky Mountain Christmas, starring Dolly Parton. I love Dolly Parton, Rose. Have in the article described Moravians something in common with Moravia, the part of Czech Republic? I have never heard about these missionaries. Personally, I like watching fairy tales on TV and eating Christmas sweets. It is a Christmas must. Actually, Lisi. This is the Schoenbrunn in Ohio. Vegging out on TV and sweets is always great. Congratulations, Betti. You have won A Christmas Promise.